Today’s blog post is not addressing directly what is happening here in Venezuela at the SocialPreCOP, but something on the minds of many people here–the next step in the series of climate meetings/actions this year. 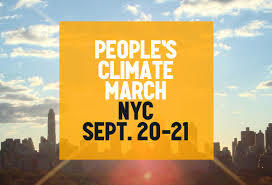 That is the upcoming climate march planned for New York City on September 21st, two days before UN Secretary General Ban Ki Moon’s UN Climate Summit–a closed door session where the world’s “leaders” will discuss “ambitions” for the upcoming climate conference (COP20) in Lima, Peru. Part of the objective of the Venezuelan government at this SocialPreCOP meeting is to come away with a set of demands from people gathered here that they can take to this exclusive summit. So no, not all “climate action” is created equal. A lack of clear justice-based and ecologically sound demands in this “historic” march will leave a vacuum. And no vacuum remains empty for long. It’s simple physics. The media will not cover a march with no demands. They will find a message. And likely, as so often happens, those with the connections and the money will win the messaging game. Right. Okay. Where to start. First of all, as has been pointed out to Mr. McKibben on countless occasions, stopping fossil fuels will not stop climate change. If business as usual continues based on bioenergy (the US military for example is transitioning some of their fleet to biofuels and is investigating the manufacture of “green bombs” using synthetic biology), then we still lose. As a scientist friend calculated, to replace the amount of fossil fuels we are currently using with bioenergy will require six planet’s worth of land. We truly do have to change the system. Not what is fueling it. Business as usual has to go. Unfortunately power concedes nothing without a demand. In fact, power concedes nothing without being given no other options. Which brings me back to the Rolling Stone article. Marching. McKibben writes about the power of marching to make great change. Two of the examples he gives are ending the Vietnam War and stopping segregation. Let’s just focus on the Vietnam War for a moment. Yes, there were marches and they were huge and they were great. There were also mass direct actions, as MayDay 1971 when affinity groups took over the bridges and traffic circles of Washington, DC with the aim of shutting down the city. My husband, who was part of an affinity group there watched the marines land at the Washington Monument. The Weather Underground conducted over 6,000 bombings of military targets in the US. There were the Yippies, White Panthers, the SDS, VVAW. The GIs in Vietnam, sick of the pointless and bloody war, started turning their weapons on their officers. The army was facing a mounting internal rebellion. And of course the Vietnamese People staged an effective and tireless resistance to the US invasion–even in the face of casualty numbers of more than 50 to one–and even in the face of their luscious homeland being turned into a toxic wasteland by Monsanto’s Agent Orange. The sum total of these parts is what ended the Vietnam War. Not a march, not promoting green alternatives to the war, and not electoral politics (unless you count the Yippies running Pegasus the Pig for President in 1968). People on many fronts made both the war and business as usual impossible. Likewise with segregation. The civil rights movement did not make the gains it made with a march that was organized with the permission with the police… There were marches, yes, but the marches themselves were unpermitted acts of civil disobedience, and they were met with extreme repression fuelled by hate. We all remember the black and white videos of the firehoses and the police dogs; the many civil rights activists who were beaten, jailed, murdered. There were bus boycotts and lunch counter sit ins. And these nonviolent actions collectively represented a fundamental challenge to power. And not to forget the crucial role of the Black Panther party, which took up arms in 1966 in order to further advance civil rights and to defend their communities against attacks by the police. But they also ran breakfast programs for children and promoted a comprehensive set of demands. But back to this march in New York City, planned in cooperation with the police, and void of demands. Will the mere presence of 200,000 people marching in the city be meaningful enough to make a difference–to shake up the world’s leaders to take climate change more seriously? In his Rolling Stone piece, McKibben quotes a Princeton scientist who stated, “we are all sitting ducks.” That is true. However, the missing analysis in this assertion is identifying just exactly who is holding the shotgun. The inference is that it is climate change pointing its double barrels at us, but I disagree. We are sitting ducks alright, but the ones threatening our existence are the ones on Wall Street and its equivalents, buying policies that maintain business as usual. Like Chad Holliday, the Chair of Bank of America (who co-Chairs the UN’s absurdly named Sustainable Energy for All initiative), the Koch Brothers, Chase Manhattan Bank, and on and on. A smorgasbord of power elite. My hope is that some folks coming for the march will be inspired by the powerful accomplishments of the movements that came before and will form affinity groups to take their outrage and their demands directly to the source. Directly to the ones holding the shotguns. Making their business as usual impossible.